There’s a lot I could tell you about him but right now I want to tell you the story of a firefighter’s helmet. One day himself pulled from the top of the bookshelf an old leather fire fighters helmet. He called me over to look at it asking me if I thought the fire fighters family might like to have the helmet re-enter their lives. Rhetorical, of course, as I hadn’t yet shared my special gift with him. Anyway, the helmet was obviously fairly old as it was weathered and cracked in spots. On the front was hand painted “Engine 23 SFFD.” Under the neck flap, neck protector, whatever, was a name-Betti, with the number 005 hand painted just above the name. A little while later I heard him on the phone with the San Francisco Fire Department’s Museum where he asked all sorts of questions about the man, and whether or not they had any suggestions to how he could track down anyone who could help him. I knew he wasn’t getting anywhere as he then called the San Francisco Public Library asking about archives, obituaries and whether or not they had any advice on researching this man, as he was coming up short everywhere. He spent hours online, when he should have been looking to company commitments, trying to find this Betti fellow in any records tied to the fire department in San Francisco. After a couple of days of phone calls and endless searches online he gave up returning the helmet to the shelf. 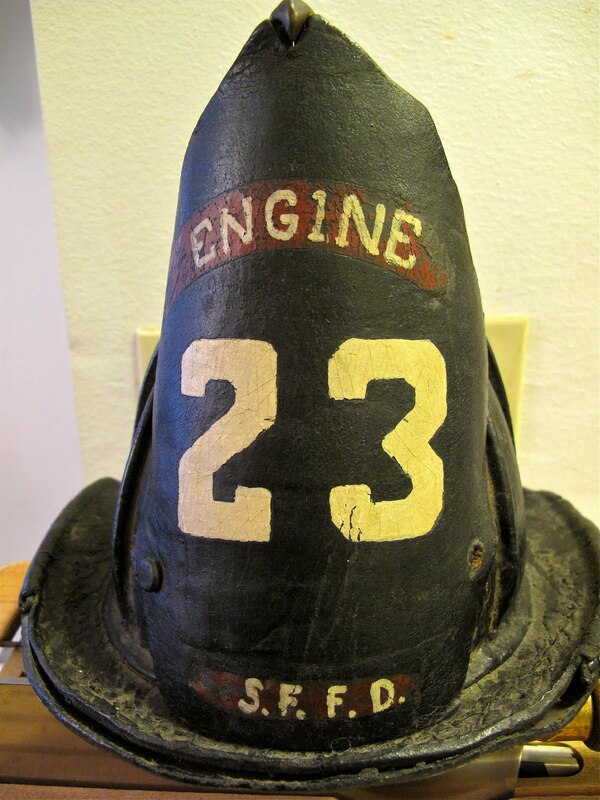 About two weeks later he called to me, “Hey Sage, I never looked into where Engine 23 was and if there are any clues there to follow.” He jumped online to find it had been an engine company in the neighborhood in San Francisco where he spent some of his youth. A neighborhood that abutted sand dunes stretching west towards the Pacific when Engine 23 moved to 3022 Washington Street in 1893.
! He was committed to finding out who this man Betti was and why the helmet was sitting on our bookshelf. He got a different person at the Fire Department museum who gave him the name of the fire fighter who acted as the director of the museum when he wasn’t out fighting fires. Himself dashed off an email that he read to me, as if I was going to be his editor. In it he explained that he had no idea how this helmet arrived in our little abode. He told the fella that the helmet had hung in their family cabin for years and finally came his way after certain items were distributed from the cabin after it’s sale a few years before now. He couldn’t remember if he had ever heard why or how the helmet had entered their lives. He just shared that he remembered seeing it in the cabin for years. He also told the man that he had never heard of or known anyone named Betti. Prior to hearing anything concrete he did some research on the firehouse finding the following photo shot sometime after the firehouse, Engine #23, was disbanded around 1953. Engine 23 has been relocated out in the Sea Cliff area near the Pacific miles from it’s historic home. The purpose of the tower was to allow Firefighters to hang the wet hoses up after a fire. In a couple of days himself heard back from a firefighter named Mike who had gathered quite a bit of information on Mr. Betti. With this information my human contacted the Administrative offices of the SFFD to determine if there were any family members who might be interested in receiving the helmet. Mindy, in the Admin offices, wasn’t initially hopeful she could locate the old records but said she would give it a shot as she thought the idea of returning the helmet was a great one, as she knew how much it would mean to family members. Phone call after phone call, email after email, to all sorts of supportive people all engaged in trying to find if there was any family left to contact. I realized that this wasn’t going to end until Wild Mick, I’ll tell the story on his moniker another time, had found someone who could definitely tell him if there was any Betti family left to contact. While waiting for responses from the Historical Society, California Fire Fighters blogs, San Francisco Chronicle and Examiner, San Francisco Library, SFFD Administration offices, firefighters Mike, Paul, Terry and Bob, my friend tried to find a newspaper article on the fire as it seemed that there would be coverage of a firefighter dying at a fire. It became clear, after talking with one of the papers, that Alfred Betti dying of a heart attack at a fire may not be so newsworthy though the archivist would continue to look for us. Did I say us? Yes, I was getting as excited as he was though not so much that I was going to blurt out any suggestions. Ok, a couple of days ago Mike called telling my man that he had some more information on Alfred Betti and would forward it by email. The exciting thing was that Alfred had a son who was presently living in Kihei, Hawaii. Mike had called him, as did Mindy though neither knew the other had found him. Apparently Phillip, aged 84, did not have anyone to leave the helmet to and would be pleased if my man would give it to the SFFD. Alfred married in about 1927, Carmel Ann Callaghan, born 7 July 1899, died 13 June 1986. Social Security says she died in Maui County, HI, but the California Death Index says that she died in Sonoma. Her SSN# was 559261217. The 1930 census indicates that they had no children at the time. Alfred had a brother named Leslie P. Betti, born 19 Nov 1904 in San Francisco and died 12 Apr 1967 in San Francisco. He married Myrtle L. Sparks. There is a family tree that contains Leslie, but does not list any children for him. I found an obituary, and it lists one child, Phillip R. Betti. Yesterday my friend called Phillip in Hawaii. Phillip told him that he had not thought about the days surrounding his father’s death for many years. When asked he said he was so happy that so many people in the SFFD were concerned enough to take their precious personal time to care so much about returning his dad’s helmet to him. He told my friend that he had just returned from the Korean War when his pop died. He shared memories of hanging out in the firehouse watching the men string up the hoses into the tower. He told further stories of helping the firemen clean the truck allowing him to wear boots that came up to his waist. He repeatedly told my friend how happy he was to be reliving these memories that had faded for so long. He told of moving to Hawaii and having a good life full of the usual ups and downs. He said he was happy that he had been found and that the helmet would return to the SFFD to be put on display honoring his father. After some silence my friend rang off. He sat there staring out the window wiping tears away as they rolled down his cheek. ( A couple of years ago my dear friend Sage went ahead of me to find us the perfect fly fishing stream. She so much enjoyed our outdoor adventures. P.S. Thank you Mike, Paul and Mindy for helping my human with his quest. Thanks to the SFFD Museum people, SF Library, California Historical Society, SF Historical Society, St. Elizabeth’s Hospital, SF Chronicle. That all of you took your time to help has been so heartwarming. Thank you SFFD for all the adventures you gave my humans dad. P.S. Thank you Mike, Paul and Mindy for helping my human with his quest. Thanks to the SFFD Museum people, SF Library, California Historical Society, SF Historical Society, St. Elizabeth’s Hospital, SF Chronicle. That all of you took your time to help has been so heartwarming. Thank you SFFD for all the adventures you gave my humans dad.